...Leading to a spike in murders that has transformed Baltimore into America's deadliest city. "What officers are doing is they’re just driving looking forward. They’ve got horse blinders on," says Kevin Forrester, a retired Baltimore detective. "These people don’t realize that you’re leaving people fatherless and motherless," Gaines says. "I feel like they think they’re untouchable." On a sticky morning in May, the Rev. Rodney Hudson slips on a black "Sermonator" T-shirt and walks down the street from his west Baltimore church, a gray stone edifice two blocks from where police arrested Gray. A few days earlier, a drug crew from another neighborhood set up camp on the corner across the street. Hudson says the dealers nearly got into a gunfight with the crew that usually works across from the elementary school down the block. "Drug dealers are taking control of the corners and the police’s hands are tied," Hudson says. "We have a community that is afraid." To be sure, the investigation did expose some legitimate corruption, including incidences of officers planting drugs and other evidence. Police Commission Darryl De Sousa resigned in May after federal prosecutors charged him with failing to pay his income taxes. But with the wave of protest and anti-police threats, officers absorbed the message that they shouldn't take unnecessary risks when making stops. And that affect isn't limited to Baltimore. Nearly three-quarters of the officers who responded to a Pew Research Center survey incidents like the Gray killing had left them less willing to stop and question people who seem suspicious. Others said the incidents had made stopping people harder. Meanwhile, civil rights advocates have accusing police of laying back on enforcement as a means of retaliating. "What it says is that if you complain about the way the police do our job, maybe we’ll just lay back and not do it as hard," says Jeffery Robinson, a deputy legal director for the American Civil Liberties Union, which had advocated for an overhaul of police agencies in Baltimore and elsewhere. "If it’s true, if that’s what officers are doing, they should be fired." Another criminologist pointed out that police are largely doing as the public asked: They're lessening the racial disparity in the number of people they stop and the number of police-involved shootings and complaints. 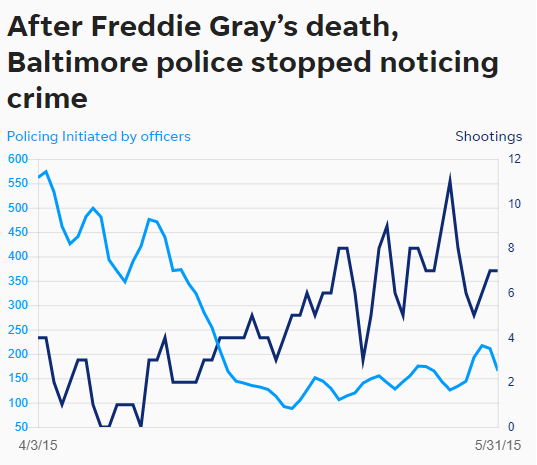 "The cops are being less proactive at the same time violence is going up," says Peter Moskos, a John Jay College of Criminal Justice professor and former Baltimore officer who reviewed USA TODAY’s data and analysis. "Cops are doing as requested: lessening racial disparity, lessening complaints, lessening police-involved shootings. All those numbers are just great right now, and if those are your metrics of success, we’re winning. The message has clearly gotten out to not commit unnecessary policing." "These guys have family members who tell them 'Don’t go to work and chase people for a city that doesn’t care about you,'" he says. "If I’m riding down the street and I see an incident, I see it, but you know what? It’s not worth it. That’s what these cops are thinking." Of course, this information probably won't stop the millions of leftists who insist that all police departments are purveyors of "systemic racism" and that "broken windows"-style policing policies - where police in America's cities are empowered to make more stops, not fewer - inevitably lead to racially motivated stops. Maybe the murder rate will need to move a little higher for them to understand how these policies have been a major contributor to the massive drop in America's rate of violent crime over the past 25 years. Or maybe, because many of them live in rich, all-white enclaves, the problem of urban crime will never truly register.